(the whole, ‘trying to make the World Love you’) is not my bag. I like just, talking to people, like you…. and to answer the call I’ve been given. yes… you would. with 9 kids in the family! If days are like this….I will definitely sign up! Pass the sign up sheet dear Laura! Watercolor underneath, watercolor above, watercolor in the middle …wherever they are it does not matter anymore. The over all look is wonderful, lovely and it had a grungy edge on it. Maybe I should try those next time! Thanks Haunani. 💜 I appreciate your guidance and friendship. LOVE this! It makes my heart sing an optimistic little chirp. Beautiful art yet again, Laura. Thank you. You’re so kind! Thanks Sissh. I love your writing…..not many people do here on WordPress, I like to discuss art and life and you like to do that, win-win situation. No I have never used a pastel ground though I have been thinking about it. My favorite paper has been out for over a couple of years and I have been spoiled. There are a few other papers that I like but not as much. 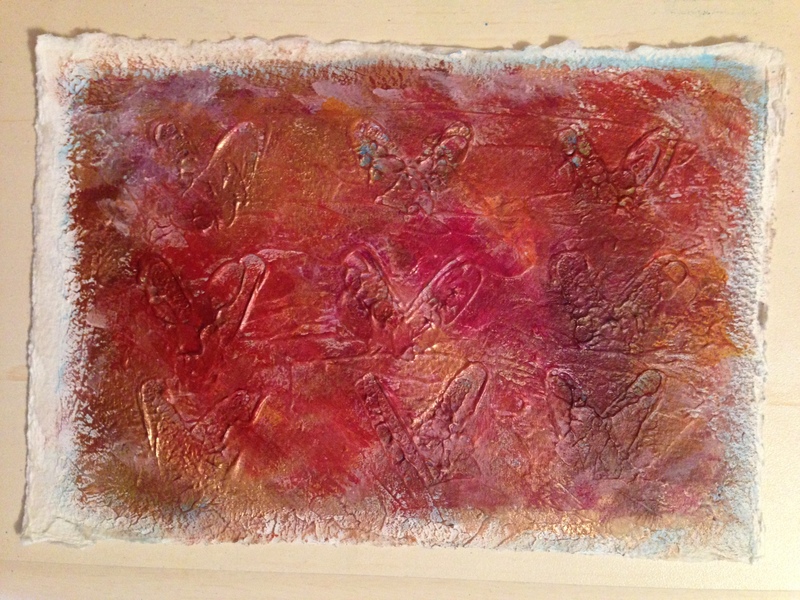 So, I have been thinking of making my own substrate but prefer to just order something and paint….lazy, I know. 🙂 I have heard that Uart has several grades and on the grittiest ones, they rival Wallis….I need to look up Debora Stewart…..ah…..they are beautiful! I guess since I am into landscapes and portraits, her work has eluded me. So beautiful! You should give pastels a try, I could see you doing pastel paintings…..you can do a mixed media I am sure. Thanks, but I have much to learn, mine wound up looking muddy which turned me off. Definitely abstract, never tried realism in pastels but when I see what you do and Mary is another one, not sure if you are familiar with Oil Pastels by Mary, I think she made a comment on here somewhere. You guys do amazing work. Rebecca too. I have a lot to learn. I’ve found acrylics the easiest to pick up so far. I thought pastel would be easy. But I have never started out the way Debora does hers, and I bet I’m working on the wrong paper when I do work on just paper. It’s just a Strathmore mixed media surface (it’s one of their better grades but it is cotton rag and not really what I’d call toothy). What paper do you like? Oh, I love Mary’s oil pastels! I am hoping to get some next month. So Deborah’s pastels are soft pastel? right? I took a look at her paintings and yes, they look like soft pastel. Did you get the soft or oil, a big difference. My favorite paper for pastels are Pastelmat, Uart (used enough to know that I like them) and also La Carte of which I used a lot in the past but got hooked onto Wallis which is always out or not being made. I like the sanded paper because I am aggressive and need to have a sanded paper to handle my manhandling approach. lol yep, I am a handful! Strathmore mixed media surface was probably too smooth. I hate Canson because it takes just so much and it doesn’t want to accept anymore pastel. I go on heavy and rich and then some! Thanks, Teri! The texture came from Golden’s fine pumice gel, which I’d never tried before, and I do love it. Have you ever tried this? I learned about it from Chris Cozen’s videos. It turns any surface into one that will accept watercolor, but yet it’s an acrylic surface. It’s also writeable and drawable. Has a bit of grit to it, but it’s a very fine texture. I really liked it. My colors on the gel were the problem with the painting; I really loved the texture too. You can lift color from this stuff but there was too much of it in this case and, I just felt like it was easier to paint over it in acrylic. If you ever do, let me know! I just love it. It’s almost like a creamy sandpaper, just wonderful. And WC overtop of it is really nice. I’m so glad , Rebecca, and happy WEEKEND to you! lol it made me laugh too, as I thought I’d learned more from a looooong, drawn-out painting fail. hehe. Amen, Lucy! Thanks for your encouraging words. Your WC abstracts are seriously blowing me away. They are so very unique and beautiful. Your colors just sing and your compositions are perfect. I am really just gaga over them! Love those textures Laura – awesome goodness in there! Have a great weekend my friend! Thanks, Deb, it’s golden fine pumice gel, you ever tried? It was my first go with it, I absolutely love it but my issues with this one were color and just too much to lift back and repaint, so went with the acrylics to cover. Love this piece of art with full of energetic colors and love! Thank you Snehal! You’re too kind! Thanks Jill! It’s all different now lol. I hope it’ll morph into something beautiful, like your paintings do! This is lovely!! 😍Even if watercolor isn’t your “go to” medium, I’m thrilled you’re trying it more this month. I love the fluidity of the acrylics that you get when you bury a watercolor! It’s totally cool! !